Judge Larry Potter said he had little choice today but to allow the new owners of the former Nineteenth Century Club headquarters at 1433 Union to do what they wanted with their property. The owners have expressed plans to demolish the property, but Potter said they must show him proof that they've pulled the proper permits by August 26th before the demolition can begin. "I do not like the fact that your client wants to demolish the building, but they have met all the requirements under the law," Potter said, addressing Linda Mathis, an attorney with Union Group LLC who represents the new owners, Liang Lin and Xiao Dan Chen. The case had been reset to today because preservationists were attempting to salvage the hundred-plus-year-old home by asking an attorney to look into possible illegalities around the sale of the building. The Lins won the property at auction in January, but there was some belief that the Nineteenth Century Club may have violated its by-laws with the decision to sell because the sale may not have been properly authorized by all of the club's membership. Attorney Webb Brewer told Potter today that the Tennessee Attorney General's office had said they'd evaluate the complaint, but they gave him no guarantee they'd take on the case. No action had been filed in chancery court, the court that would have jurisdiction to look into such a case. Potter's Environmental Court would not have jurisdiction over the possible illegality of the sale of property. 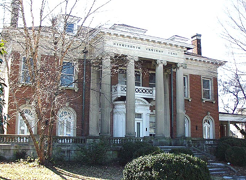 Potter told the courtroom that, although he wasn't happy about his decision, he had little choice but to let the new owners move forward with plans to demolish the historic home. Since the attorney general's office had not promised to take up the case or provide a timeline of when they may, Potter said the court must move forward.